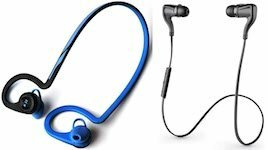 Here’s a comparison of two excellent and very popular Bluetooth sports headphones: Plantronics BackBeat FIT Bluetooth headphones vs Plantronics BackBeat Go 2 Bluetooth headphones. 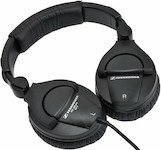 This post includes a features chart to help you choose between these two headphone sets. 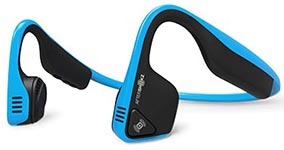 The Plantronics BackBeat FIT headphones offer Bluetooth convenience in a set of waterproof headphones that are designed for active people, such as runners. They are also ideal for wearing while working out at the gym. However, Plantronics also makes the extremely popular Plantronics BackBeat Go 2. These headphones are quite a bit cheaper than the BackBeat FIT. So the question is: are the cheaper Plantronics Go 2 headphones comparable in quality with the Backbeat FIT? 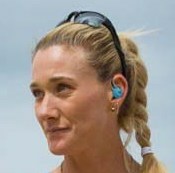 Ear fit Comes with a molded earpiece, no removable buds. They either fit or they don't. I find them very comfortable. Because they don't have to be shoved all the way into your ears, fit is not crucial Comes with three sizes of soft, removable tips. Battery indicator Small icon shows on smart phone to indicate battery level - battery level can be checked at any time by touching tiny button on right headphone. The voice tells you one extra battery level - Headphones FULL (as well as High, Low, Recharge). Small icon shows on smart phone to indicate battery level - A voice tells you battery levels (High, Low, Recharge). Note that the Plantronics BackBeat FIT are currently on sale at Amazon! Both of these sets of headphones come with micro USB chargers. They are totally generic, so you can use any micro charger, which is handy. There is a difference when it comes to cases. The Plantronics BackBeat FIT headphones arrive with a good-looking neoprene carry case that you can use to transport the headphones. If you turn this case inside out, you will find a band that you can wrap around your arm, so that you can carry your smart phone on the top half of your arm while you exercise. This is a very handy extra. On the other hand, the basic BackBeat Go 2 come with nothing at all – as you might expect at such a low price point. This on-the-go charging is very necessary on the BackBeat Go 2, which only have 4.5 hours of battery life – really not enough for most people. On the accessories side, Plantronics BackBeat FIT headphones are certainly better than Plantronics BackBeat Go 2 headphones. Take a look at this video, which shows how great the Plantronics BackBeat FIT headphones are for exercising. One is cheaper – which is better? 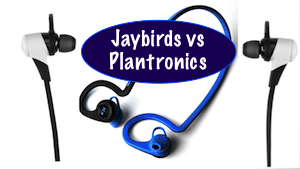 Plantronics BackBeat FIT #headphones vs BackBeat Go 2. The Plantronics BackBeat Go 2 Headphones weigh 14 grams, so they are much lighter than the Plantronics BackBeat Fit, which weigh 24 grams. However, I don’t believe that this makes any difference. Who can tell the difference between 14 grams and 24 grams? No one – so this is a situation where size does not matter. I would gladly carry the extra 10 grams to have headphones as strong and sturdy as the BackBeat FIT. However, despite being so light, the Plantronics BackBeat Go 2 Headphones feel very sturdy, and look quite big in your ears. The Plantronics BackBeat Go 2 Headphones are designed to block out ambient sound, giving you an immersive sound experience. The Plantronics BackBeat FIT are designed to NOT block out ambient sounds, so they do NOT give you an immersive sound experience. The reason is that the Plantronics BackBeat FIT are designed for athletes who will be wearing the headphones while cycling or running, and need to be aware of sounds around them, for safety reasons. However, if you are going to be using Bluetooth headphones in a noisy place, you might want to block out ambient noise. So it comes down to personal choice – if you are not worried about hearing ambient noise, the BackBeat Go 2 could be right for you. But if you are using your headphones while cycling, running, or walking, you might want to make a safer choice by using the Plantronics BackBeat FIT. This is very different. Both have non-replaceable lithium batteries, but the BackBeat Fit has a very respectable 8 hours of listening time – while the BackBeat Go 2 only has 4.5 hours. Charge time is similar. On this one, the BackBeat FIT definitely is better than the BackBeat Go 2. I don’t think 4.5 hours is long enough for most people. In this aspect, the Plantronics BackBeat FIT beat the BackBeat Go 2 headphones hands down. BackBeat Go 2 are sweat-proof, but they are not waterproof. As for the BackBeat FIT, Plantronics claim that they can be immersed a meter deep in water for up to 30 minutes. This is great, and should mean they are 100% sweat resistant, and also will be just fine if you accidentally step into the shower with them. I have used them while floating around in a pool, which is just great. 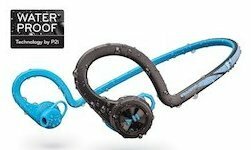 Given that sports headphones may be worn in the rain, I think the waterproof aspect of the Plantronics BackBeat FIT headphones gives them a distinct advantage over the BackBeat Go 2. This one is a bit subjective. However, the BackBeat Go 2 headphones seem to have less bass and be a bit more “tinny.” They just don’t have a sound quality that is as good as the BackBeat Fit. 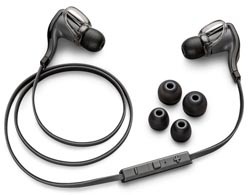 Frankly, the sound quality on the Plantronics BackBeat FIT is phenomenal for the price – outstandingly good sound for a very reasonable price. So I would say that the Plantronics BackBeat FIT have better sound quality than the BackBeat Go 2. 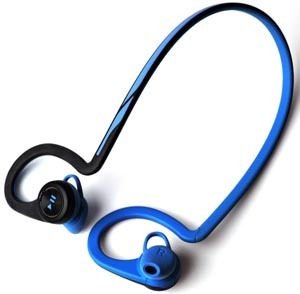 Also both sets of headphones connect with you via a female voice, and I have to say I like the BackBeat FIT voice better. Her voice is just a bit more mellow and gentle than the voice of the BackBeat Go 2. On this, the Plantronics BackBeat Fit headphones definitely beat the BackBeat Go 2. Both of these Plantronics Bluetooth headphones have little plastic loops to keep the headphones in your ears. They do help a bit. On the BackBeat FIT the plastic loops are fixed in place, but you can swivel the eartips themselves until the loop is in a position that helps to “wedge” them in place. On the BackBeat Go 2, the plastic loop can be swiveled independently until you find the position that works for your ears. These little plastic loops help to stop the headphones from falling out of your ears, but they only work about 80% of the time. Luckily, the BackBeat FIT have something that really helps to keep the headphones from falling out of the ears. If you look at the photo of the BackBeat FIT, you can see that the molded rubber strap has loops that hook over your ears. On the BackBeat FIT, this functions as the main stabilizer. This has the result that the BackBeat FIT pretty much never fall out of my ears. These are the only headphones I have ever had that don’t fall out of my ears at all. They just stay in place. Sometimes I am searching for my headphones, and then I realize they have been in my ears the whole time! They are just so comfortable that they seem to become part of my body. So in terms of fit, both BackBeat Fit and BackBeat Go 2 are good, but FIT headphones are better, because they just don’t fall out. I also find the BackBeat FIT more comfortable than the BackBeat Go 2, but this is purely subjective. If you like the marshmallow feel of soft earbuds, rather than silicone, you will probably prefer the BackBeat Go 2. This sounds like a strangle one, but I find it important. Say for example you are listening to your headphones, and then your wife starts talking to you. You need to remove your headphones (assuming you want to stay married). After that, it might be a long time before you get around to putting the headphones back into your ears again. With the Plantronics GO 2, you can just leave them hanging around your neck, inside your shirt. They’re not going anywhere, as their cord is so long that they stay put around your neck. 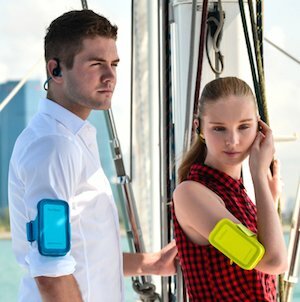 But with the Plantonics BackBeat FIT, because the band is shorter than the GO 2’s cord, and is relatively heavy, they move around and can fall down your back and out of your shirt. I have even had them try to make an escape down my sleeve! So your best bet is to pull them off and stuff them into a pocket. However, if you forget to do this, there is a (very slight) risk of losing them. 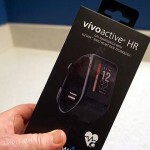 So on this one, Go 2 wins over Plantronics BackBeat FIT. Theoretically, you could wear the Plantronics BackBeat FIT in both ears while cycling, because they are especially designed to let in ambient noise (as they were designed with runners in mind). However, I don’t do that – I prefer to have my left ear totally devoted to listening to traffic. I find it really easy to position the BackBeat FIT headphones, put on my helmet, and then remove the left-hand earphone. They stay in place just fine. They are very flexible, which makes this easy. I find that even while just walking, the Plantronics BackBeat Go 2 cord is really quite long, and can touch my cheeks and irritate me. On the other hand, I have heard some people complain that running with the BackBeat FIT headphones can be annoying too, because the rubber cord bounces on their necks. I guess anything can be annoying. But if I had to run, for example if I was being pursued by an angry mob, I would prefer to be wearing the BackBeat FIT, because I know they would not fall out. It would be awful to be running for your life and have your motivating music stop suddenly! Both of these headphones work well for taking phone calls while on the move. Both sets have similar controls: Stop/pause/back up a track/advance a track/adjust volume/answer or decline call. Both sets have tiny controls, but I find them both quite easy to use. The BackBeat FIT have the integrated into the headphones themselves, and are very tiny. But they are brilliantly designed, so that you can work them with your fingertips without looking at them. I had trouble at first, but that was because I did not bother to read the manual. Once I did, I was really amazed at how easy they are to use – even to control the volume. The BackBeat Go 2 has the controls on a tiny little rectangular unit near the ears. This is easy to work with, and it’s easy to control the headphones. So this issue, it’s a tie – both are cleverly designed and easy to use. The Plantronics BackBeat FIT headphones do not stick out from your ears much – they have a flat profile, which I like. I don’t need blue things protruding from my ears. I even find them quite stylish – I am not embarrassed to be seen in public with my BackBeat Fit. The Plantronics BackBeat FITheadphones also have a reflective finish to help you be seen at night. But as they are tiny, I do not think they are a major safety feature. The BackBeat Go 2 headphones definitely protrude a bit more. So on balance, I think the Plantronics BackBeat FIT look better. However, this is a very subjective measure – you might prefer the look of the BackBeat Go 2. If you do, you might want to order the black ones rather than the white ones, as these are more obviously headphones, not hearing aids. 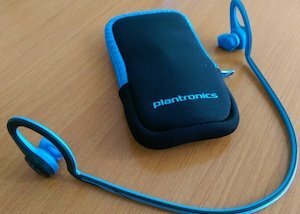 Plantronics FIT are available in green or blue. The BackBeat Go 2 are available in black or white. No rating here – this is purely subjective – depends what you like. I am fond of blue, and have never owned a black car or a white car or a grey car – I just like colors, rather than the absence of colors. So I guess it is not surprising that I like the bright colors of the BackBeat Fit. 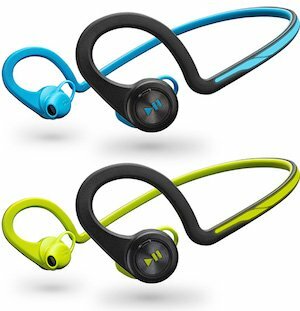 Plantronics BackBeat Fit are available in blue and green (or is that yellow)? My experience with the Plantronics BackBeat FIT headphones is that they are very sturdy and rugged. I sleep in them, sleep on TOP of them, drop them, wear them in the rain, wear them while floating in pools and in the ocean, drop them in puddles – and they just keep on going. The BackBeat Go 2 also seem to be really tough and strong, with a sturdy feel to them. However, I have not owned them long enough to be able to compare their durability with the BackBeat FIT. I find pairing to be seamless with both the BackBeat FIT and the BackBeat Go 2. The Bluetooth pairing for both was quick and easy to set up, and there is almost instant pairing every time I switch them on. No complaints at all here. And no skipping either. Plus, both these sets of Plantronics headphones almost never lose their Bluetooth connection. This one is a tie as they are exactly the same – absolutely excellent. These are very different on the BackBeat FIT and the BackBeat Go 2. The BackBeat Go 2 have soft foam ear tips that can (and do) fall off. On the other hand, the FIT headphones have silicone hard-bud earphones that are molded to fit into your ears. I much prefer this, because there is nothing to lose. On the other hand, if the silicone earphones of the BackBeat FIT don’t fit you, there is not much you can do about it. At least with the BackBeat Go 2, you can choose between small, medium and large. I call this a tie, because for the Plantronics BackBeat FIT there are no parts to lose; but on the BackBeat Go 2, you have a choice of sizes. 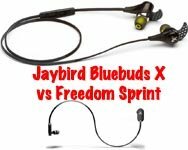 I did NOT expect to like the Plantronics headphones as much as I do, as I have been a big fan of JayBird headphones (Jaybird Bluebuds X2 are reviewed here) for a long time. But since I have been using different kinds of Plantronics headphones, I have been very impressed. 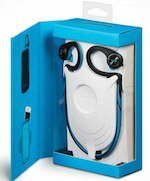 Both the BackBeat FIT and the BackBeat Go 2 are excellent headphones and worth their asking prices. In terms of my personal preference, I definitely prefer the Plantronics BackBeat FIT. But the BackBeat Go 2 are also very good headphones for the price. It comes down to what you like, and how you plan to use the headphones. 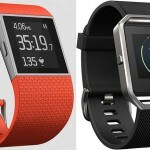 In terms of safety, I would certainly recommend the BackBeat FIT over the BackBeat Go 2 for cyclists and runners. How good is the Plantronics BackBeat Fit “Bass” sound quality?.. Can it do a deep punchy bass?.. Thank you..
Hi Teguh. The bass is excellent for the size of the earbuds, especially as they do not isolate noise (they are not designed to do this). The bass cannot be as deep and overwhelming as on over-the-ear headphones. The bass does not distort, even at top volume. However, it is not what I would call the deepest or most enormous bass. You will get more punchy bass from Jaybirds and from Dr. Dre’s. One thing I rarely see covered in Bluetooth headsets is microphone performance, especially outdoors or in a noisy environment. 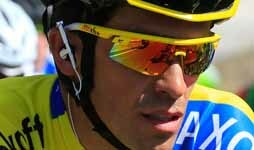 I returned a Jabra Rox set because people told me they heard ambient noise louder than my voice – one time I couldn’t carry out a call in my car,. and talking while on a bike with wind jammed into the microphone was straight out of the question. 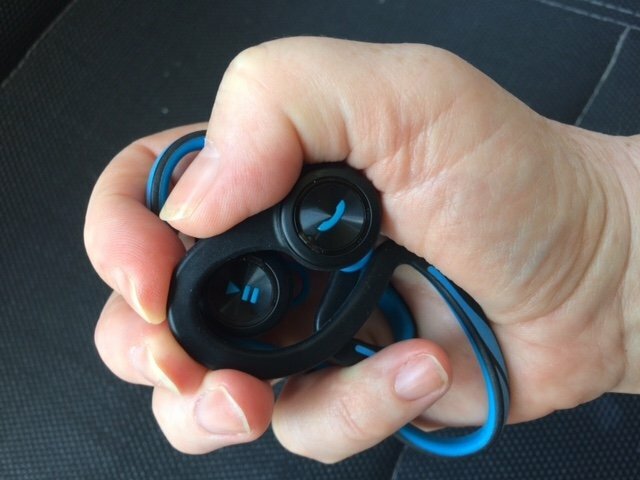 I’ve almost made up my mind to try out the BackBeat Fit, but for future readers and reviews, I really hope reviewers would pay more attention to this headset aspect – they’re handsfree devices, after all. You’re right Lyubomir, and the microphone performance is a really important aspect to me. Talking on the bike is really challenging, though. I mean, there is going to be wind noise. I always use Windstoppers now, as they help a lot. I also find that over the years, the microphone performance is getting better and better with all brands. I am also quite interested in thse new bike helmets they are bringing out that have lights and speakers built into the helmet – I think I need to get one of those. But I have not yet come across one I like enough to buy. Beats actually makes one, but the catch is – I prefer Jays, as is obvious from my review 🙂 I will no doubt get one one of these days, though, as the technology just keeps advancing and advancing. I want one with built in sound system and lights.